In just a few days, the Pilot astrophysics experiment will be launched under a stratospheric balloon from Alice Springs in central Australia. Its aim is to observe the polarized emission of dust particles found in the interstellar medium of our galaxy and nearby galaxies. With a mass approaching one metric ton, Pilot uses the largest balloons ever launched by CNES, the French national space agency. The experiment was developed by the Research Institute in Astrophysics and Planetology (CNRS/CNES/Paul Sabatier University), the Institute of Space Astrophysics (CNRS/Paris-Sud University), and the Institute of Research into the Fundamental Laws of the Universe (CEA-Irfu). The first Pilot flight was launched from Canada in September 2015; the forthcoming flight will thus be its first flight in the southern hemisphere sky, which contains more features of interest for Pilot than the northern hemisphere. The emission of dust particles in the interstellar medium of our galaxy and nearby galaxies is slightly polarized, as the particles are elongated and aligned with the magnetic field that prevails in the interstellar medium. The measurements obtained by Pilot will help scientists understand the nature of dust particles and why they are aligned in this way. The measurements will also be used to map the geometry of the magnetic field, which plays an important part in contracting the gas in the interstellar medium, a phenomenon that leads to the formation of new stars. This emission is also an obstacle for experiments that seek to accurately measure the polarization of the cosmic microwave background, and Pilot’s measurements will shed more light on it, and thus improve the interpretation of the results obtained with this type of experiment. The Pilot experiment will observe this emission in the far infrared region. It is equipped with 2,048 individual detectors, cooled to a temperature of 300 millikelvin, i.e. close to absolute zero. Polarization is measured using a rotating blade and a polarizer that separates two orthogonal polarizations on the two focal planes of the experiment. Apart from the primary mirror of the telescope, all the optics is maintained at a cryogenic temperature (2 kelvins or -271°C) inside a cryostat, cooled with liquid helium, to limit the instrument’s own emission. 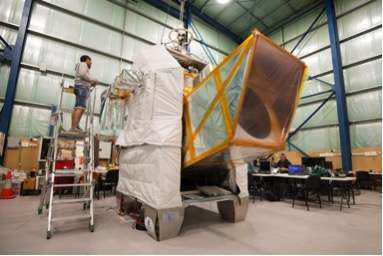 The experiment was conceived and built by CNRS scientists and engineers at the Research Institute in Astrophysics and Planetology (CNRS/CNES/Paul Sabatier University) and IAS (CNRS/Paris-Sud University), with major contributions from the CNES Balloon Division in Toulouse, the ESA, the CEA (Saclay), which developed the focal plane and its electronics, La Sapienza University in Rome (Italy), and Cardiff University (United Kingdom). The whole project is backed by CNRS laboratories and CNES funding. In a few days, Pilot will be launched by CNES as part of a campaign comprising three flights with different gondolas from Alice Springs, in central Australia. Pilot weighs nearly one metric ton and will have to climb to an altitude of nearly 40 km. It therefore requires the use of an open stratospheric balloon, approximately 100 m in diameter (the largest open balloon ever launched by CNES), and a payload chain as tall as the Eiffel Tower. The flight will take place during one of the two annual reversals of stratospheric winds, which is a prerequisite for any hope of performing observations for more than 30 hours at the ceiling altitude. Although Pilot has already been launched in the past – its first flight was from Canada in September 2015 – this new flight will be in the southern hemisphere, thus providing an opportunity to observe outstanding astrophysical sources, such as the Magellanic Clouds, satellite galaxies of our own galaxy, or inner regions of the Milky Way, that cannot be observed from the northern hemisphere. Thanks to Phys Org for this article on studying interstellar dust from a balloon. Another great article I found is also from Phys Org………. 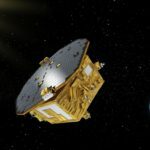 LISA Pathfinder, a mission led by ESA (the European Space Agency) with contributions from NASA, has successfully demonstrated critical technologies needed to build a space-based observatory for detecting ripples in space-time called gravitational waves. Now a team of NASA scientists hopes to take advantage of the spacecraft’s record-breaking sensitivity to map out the distribution of tiny dust particles shed by asteroids and comets far from Earth. Much of what we know about interplanetary dust is limited to Earth’s neighborhood, thanks in large part to NASA’s Long Duration Exposure Facility (LDEF). Launched into Earth orbit by the space shuttle Challenger in April 1984 and retrieved by the space shuttle Columbia in January 1990, LDEF hosted dozens of experiments, many of which were designed to better understand the meteoroid and orbital debris environment. Hope you enjoyed the read. Have a great day further!